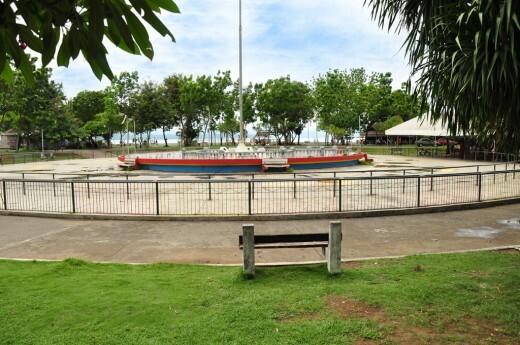 Magsaysay Park in Davao City is a beautifully landscaped public park that sits on a huge sprawling expanse that faces the clear blue waters of the Gulf of Davao with the Samal Island in the backdrop. 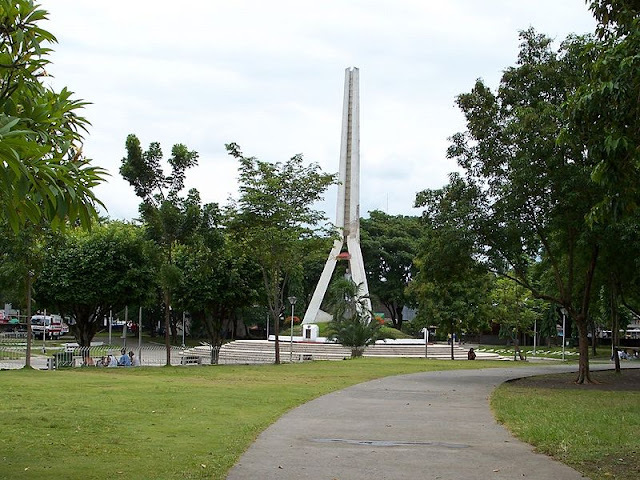 While there are many parks in Davao City, this park remains the favorite of the locals and is frequented by foreign tourists, families and friends alike for an afternoon of leisurely stroll, or simply hanging-out. 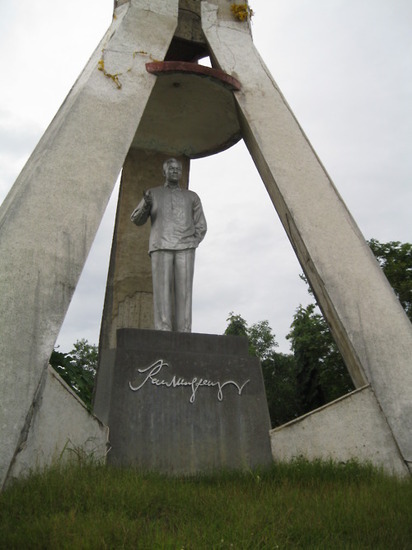 This city landmark was built in honor of the most-loved and revered president of the Philippines, Ramon Magsaysay who, in March 17, 1957, died in a plane crash in Mount Manunggal on Cebu Island while en route to Manila. 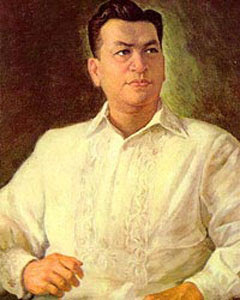 He was the third President of the Republic of the Philippines. At the center of the Park is the 25 meter long tri-pillar obelisk-like concrete tower that contains the life-size statue of President Magsaysay which serves as the main marker of the park. The monument was built through the efforts of the Davao Chapter of the Philippine Veterans Legion and was turned over to the City Government of Davao on July 31, 1960. Beloved and revered by the Filipinos, President Ramon Magsaysay is hailed as the "Idol of the Masses" because he was the first among the presidents to open the gates of Malacañan Palace to the common Filipinos. He was born on August 31, 1907. 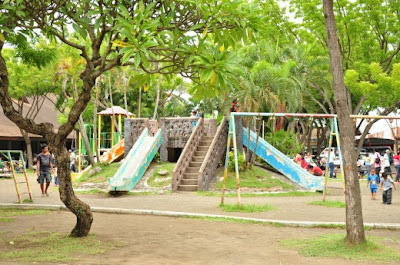 The Park features several amenities such as an open-air amphitheater which serves, among other things, the regular venue for public discos during Sundays which can accommodate 2,000 persons, a restaurant, a cooling station, several food kiosks, ornamental plants stalls, souvenir and handicraft stalls, a skating rink, a children's playground, an open-air chapel, and a secured parking area which is located south of the park. 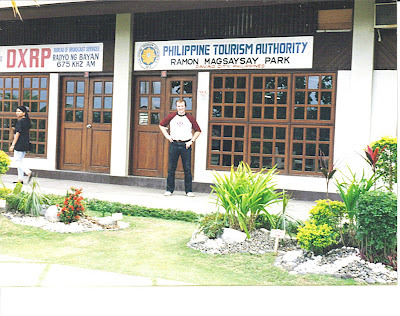 It also houses several tourism offices: the regional office of the Department of Tourism, the Philippine Tourism Authority, the Department of Foreign Affairs Regional Passport Office, the Overseas Workers Welfare Administration, the Philippine Information Agency, the Samal Island Tourism Estate Project, and the DXRP Radyo ng Bayan. 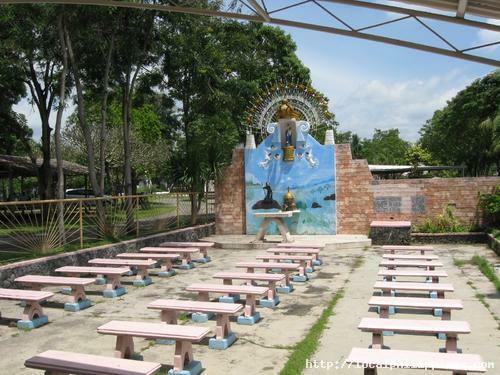 The open-air chapel of the Nuestra Señora del Pilar is located near the sea wall of the Park. Here, many Marian devotees visit the statue to pray for peace, prosperity, and good health. 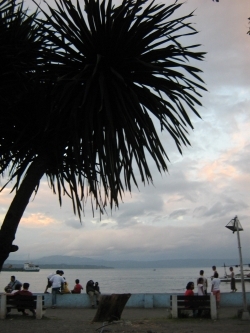 There are several benches and trees that surround the park but the most prominent are those that are along the seawall overlooking the Gulf of Davao. 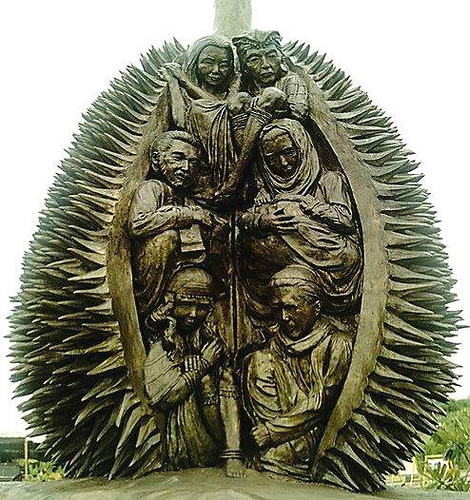 Near the entrance gate of the Park is the Pamathalaan Marker, a symbol of the Mindanaoans commitment to Pamathalaan or God-centered Governance designed by National Artist Napoleon Abueva. The project was funded by the Philippine Tourism Authority. 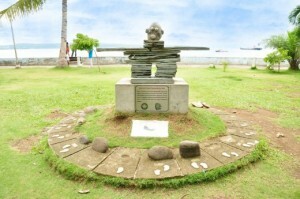 A sculpture called the "Spirit of the Shaman transformed into a Rock"
Inside the park is a sculpture of the "Spirit of the Shaman transformed into a Rock," a bedrock of solidarity signified during the Kalimudan 2007, the gathering of the Indigenous Peoples from Mindanao and homage to culture bearers, sponsored by the Department of Tourism XI and the National Commission for the Culture and the Arts. This collaborative installation was created by the Mindanao based Lumad artists and the Quebec based Inuit artists with the support of Kalinawa Arts Foundation. The Park is a popular venue for trade fairs, cultural shows, craft sales, creativity workshops, and public forums. The "Kalimudan: Pinaghiusa sa Mindanao: Mindanao Indigenous People’s Gathering/Exposition" was a week-long celebration of indigenous knowledge and wisdom which showcased a variety of architecture, and the songs and dances of the 24 indigenous communities all over Mindanao. It was the first kalimudan, or gathering, of its kind in Mindanao. 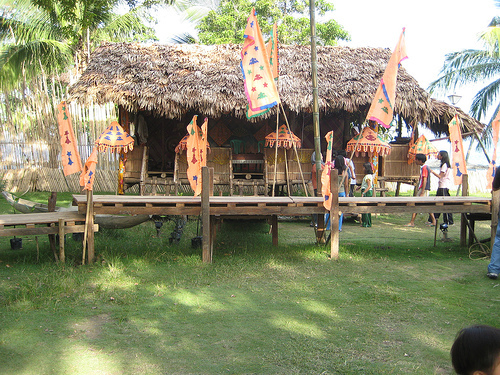 The Park is also frequented by students from the different parts of Mindanao for educational field trips. There are several food kiosks that serves a variety of grilled meat and seafood, snacks, beverages, and delightful refreshments during late afternoon to evening. Fishcado is an open-air seafood restaurant that serves daily a variety of delectable fresh seafood dishes whose ingredients are sourced fresh in the local market. Outside the Magsaysay Park is the Magsaysay Fruit Vendors Association which consists of a long row of fruit stands that sell Durian and other fruits abundant in Davao Region. The Park is easily accessible from any point in the city by private or public transportation. 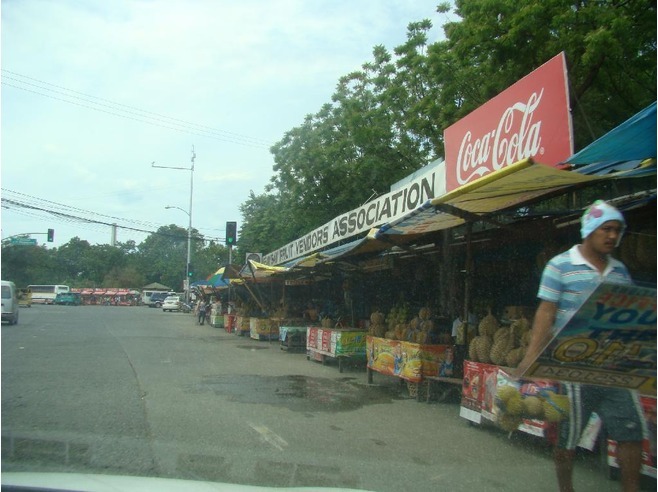 It is located in the main street of Leon Garcia Street next to the Sta. 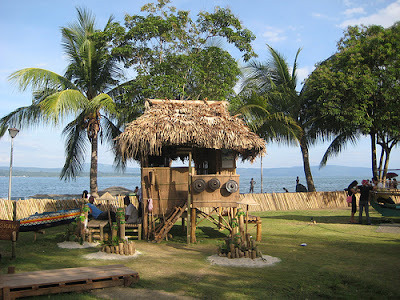 Ana Wharf, another historical landmark in Davao City where, in May 1903, the first wave of Japanese workers landed and served as agricultural workers. Those Japanese workers were instrumental in bringing about the development of Abaca industry in Davao. The Park is open daily from 5:00 AM to 9:00 PM. 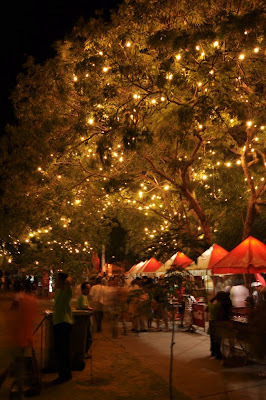 Magsaysay Park tops the list of my favorite parks in Davao City. 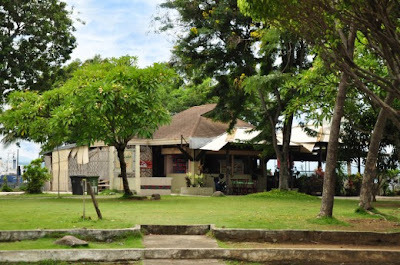 My wife, daughter, and I used to go here for a leisurely stroll in the afternoon and pig-out at one of the many kiosks. Thank you Davao Jobs for leaving a comment. 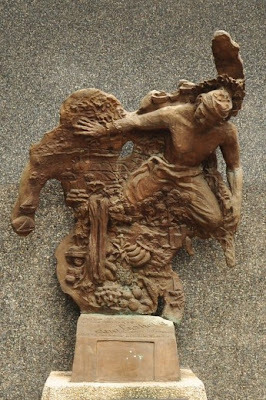 Beautifully handcrafted concrete Durian sculpture..